Approximately 180 RARE TEXAS SEPTARIAN NODULES From a single site in Central Texas. All specimens are rough -- unpolished and uncut. They are straight from a highway construction site and the only thing that has been done to them is to clean the mud off of them. 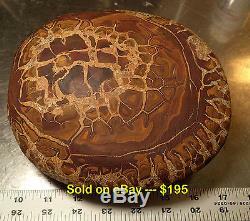 Septarian nodules have RARELY been found in Texas, but I cannot find any reference to this particular type in Texas. Specimens from this find were classified by the Director of Yale University's Peabody Museum of Natural History. 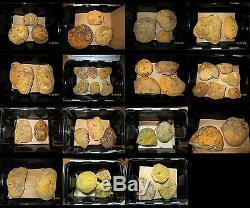 The lot consists of about 180 nodules, ranging in size from about 4" in length to more than 20" inches. 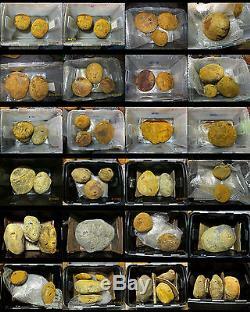 Only complete or near complete nodules were collected; broken nodules were not packed, although there are at least two hundred pounds of loose nodules that are either small or too large to put in a container. 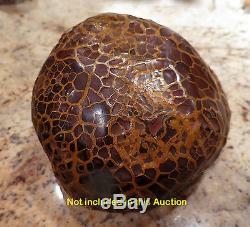 There are 40 containers filled (packed carefully with padding) filled with Septarian Nodules. The photos show all 40 containers (21" x 15" x 12.5). 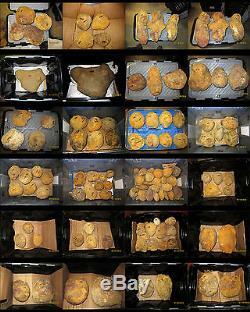 The photos demonstrate what is inside of these nodules. All nodules are different, but the vast majority have a beautiful honeycomb (septate) pattern in a background ranging from black and agate (jasper) hard, to lighter, softer material. Some of the nodules take a good polish. As a guess, I would say that about 60 percent are of this category. Nearly all have a bright red to brown central portion. I have tumble-polished about 5 of the larger (> 9) specimens and some are shown in the photos. The best way to sell the nodules is to cut them in half and sell the two halves. 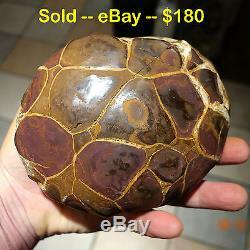 I did sell (readily) a half-nodule that was naturally broken. 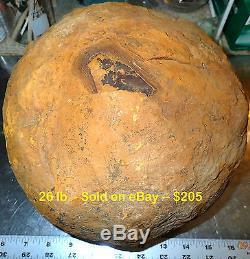 I cannot estimate accurately the total weight of the nodules, but most of the containers weigh between 80 and 120 lbs. 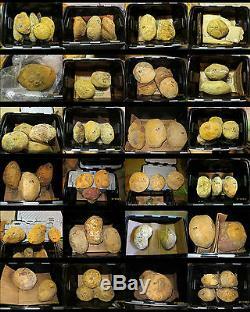 All nodules are marked (by container and by number). The following is a list of nodules and their weights and size in order to give you an idea what to expect by weight. Nodule 33D -- 10x10x5" -- 20lb 11oz Nodule 29A -- 7 x 6 x 3" -- 5 lb 2 oz Nodule 31I -- 7.5 x 5.5 x 4.5 -- 8lb 1oz Also included are about 6 tumbled specimens (see photos). You will receive all of the specimens that I have, except for one (see photos). Any questions, just contact me. 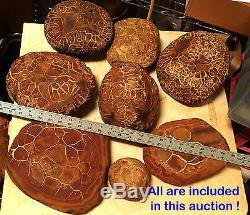 The item "Approximately 180 Very Rare Texas Septarian Nodules - Unpolished, Untouched" is in sale since Sunday, July 17, 2016. 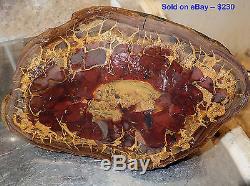 This item is in the category "Collectibles\Rocks, Fossils & Minerals\Fossils\Other Collectible Fossils". The seller is "opalologycom" and is located in North Carolina.